Remarks: The Kuttrolf, mainly from Germany in the 16th C, is a beaker commonly found with several glass tubes, sometimes twisted, forming the neck having a cup-like upper container. The example here represents a variant with a single open neck. The lower part of this beaker has a pushed in base and pontil mark. Krautsrunk is the German word for cabbage stalk. In glass it is a type of beaker with a cup-shaped mouth curving outward above an encircling thread and a barrel shaped body decorated with prunts. These were made mostly in Germany roughly between 1490-1530. It is part of group of glasses called forest or wald glass and usually is a rich dark green color. The krautsrkunk along with the berkemeyer were the forerunners of the roemer. It is a “must have” for anyone who collects Medieval glass and is rather rare. Keulenglas club glass is a variety of Stangenglas decorated with a milled trailing wound spirally around the slightly club shaped beaker on a pedestal foot with a kick. A Maigelein is a drinking cup used in the Middle Ages. 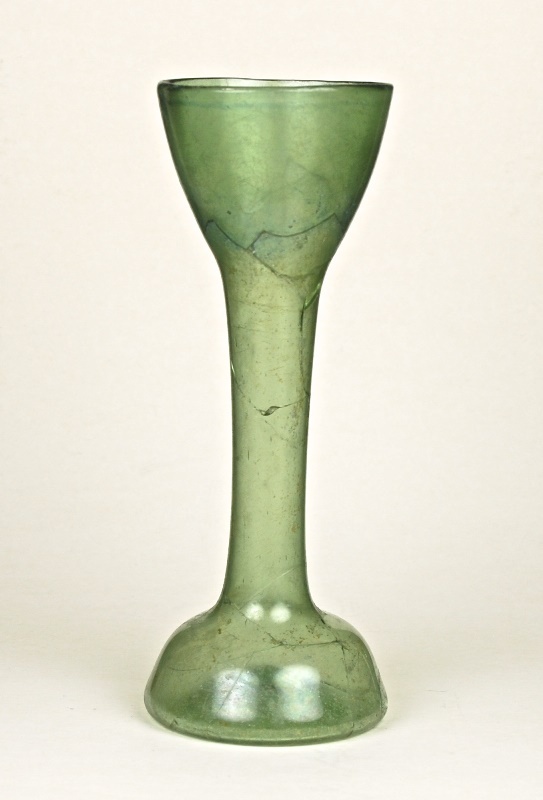 It was made from green glass called Wald (Forest) glass and has a pattern-molded design with a high kick. Warzenbecher (German) literally means wart beaker also called a bossed beaker. This is a small olive-tinted beaker molded with bosses and having a high kick in base. There are two types of beakers with this name. The first is generally lighter in color, weight and from the Netherlands as shown in this example. It is made by mould-blown decoration of drops, tears or warts on the tumbler. The bottom of this beaker has a pattern with a star derived from the mould. 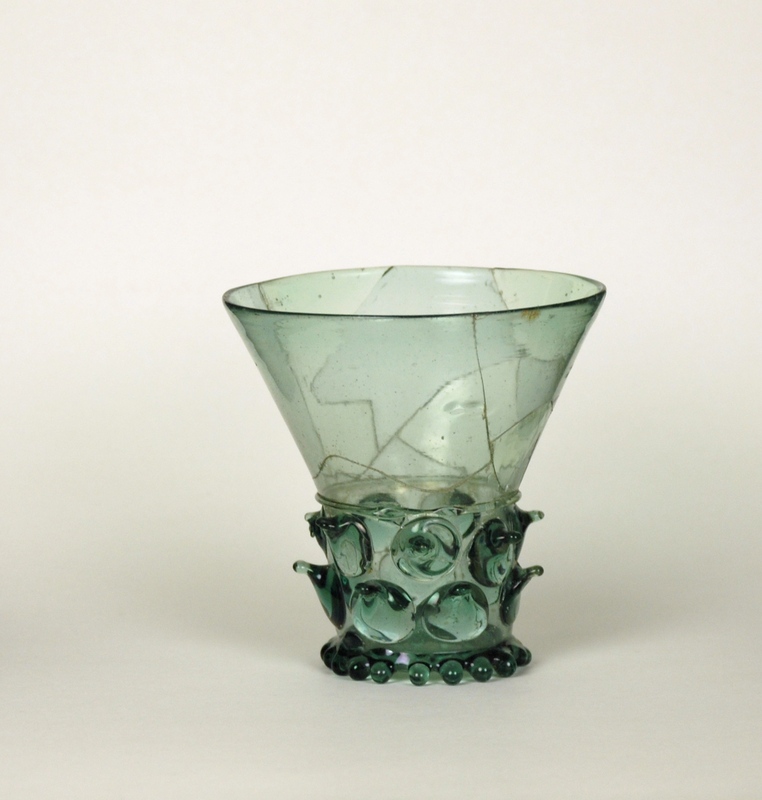 The second type is made of heavy and thick green glass in the shape of a tumbler and decorated with scattered prunts of irregular shapes or raspberry prunts. The prunts are applied to the beaker as molten blobs of glass.